The OSS Active Shooter Mass Casualty ( soft ) is a mass casualty kit containing ten (10 Individual throw kits used to treat multiple victims when involved in any penetrating trauma injury such as gunshot/s wound/s. 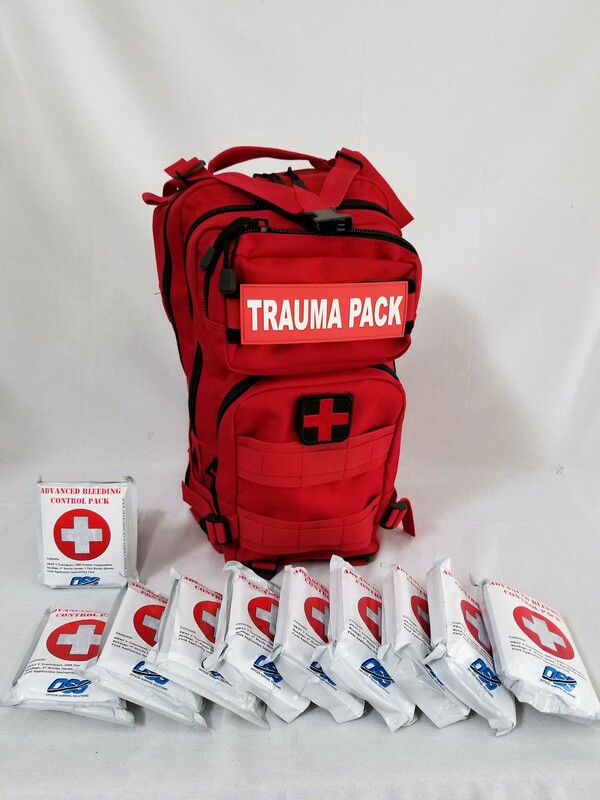 The OSS Active Shooter Mass Casualty Kit ( soft ) is a mass casualty kit containing ten (10 Individual throw kits used to treat multiple victims when involved in any penetrating trauma injury such as gunshot/s wound/s. This kit is contained in a compact, soft readily identifyable red pack to be deployed into the field as a sling pack or backpack by any officer, agent or rescue personnel .The pockets are set up to allow instant and immediate access to all the critical medical items.The throw kits contain a tourniquet, an OSS Combat Compression bandage, Sterile Packing Gauze, a set of nitrile gloves and a field instruction/casualty card. These individual kits can be dropped, kicked or thrown to individual victims in or around a mass casualty scene. The critical lifesaving medical items are typically used by medical staff to treat life threatening injuries such a those incurred by a single or multiple gunshots or penetrating trauma injuries resulting in massive and uncontrolled bloss loss. This Active Shooter / Mass Casualty ( soft ) is currently in use by several federal, state and local Law Enforcement, EMS, Fire Rescue and scholastic agencies and departments worlds-wide. This Pack is also a complete training center contained in the front cover pouch. It has an individual Training Module that is removable and deployable into any environment. It has everything you need to teach any and all staff that may have to deploy these lifesaving items into a critical incident. It also comes with a Training Powerpoint to aid those learning about the use of these kits. A typical training class can take as little as under 30 minutes for most buisnesses training 25 or more individuals. This also comes with 24 hour Training Support which allows instant access to our in house Veteran Combat Medics and medical professionals ie; various endorsing ER Physicians and Trauma Surgeons throughout the nation.